True story: I inadvertently shoplifted from Savers today. Holy embarrassment, right? Here’s how it happened: I stopped here quick over my lunch break to drop off a few bags of clothing that had been purged from my closet the night before. While I was waiting for the cashier to hook me up with my donation receipt and coupon, I saw this snazzy calendar sitting by the register and whoop, into my purse it goes. It wasn’t until I got home that I realized it said “$2.99” in the corner. Ummmm, oops! Anyhow, to make some kind of amends for my crime, I thought I’d fill you in on the sweet deals you’ll find. Because believe you me, you aren’t going to bring it home due to it’s gorgeous photos or inspiring design. 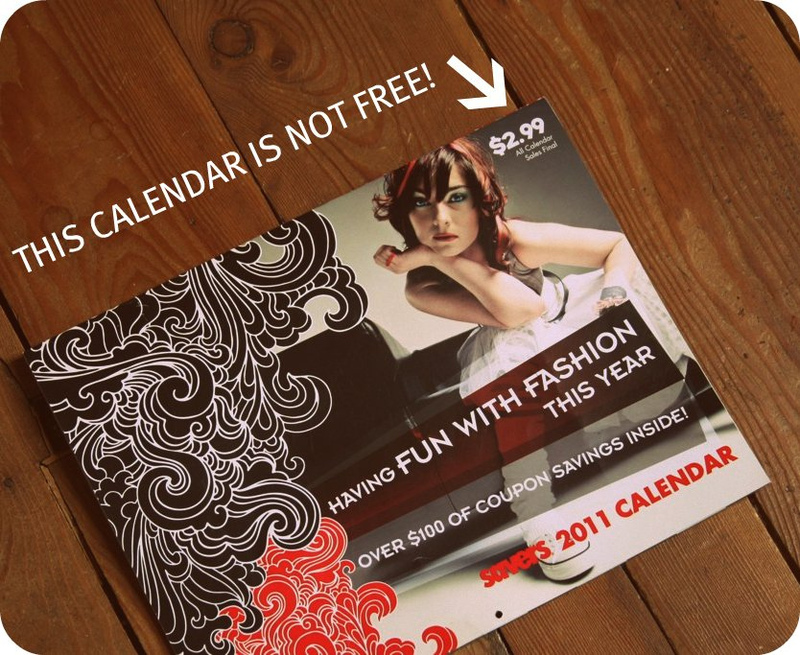 You want this calendar because it’s chock-full of coupons that’ll save you dough all the way through to 2012. 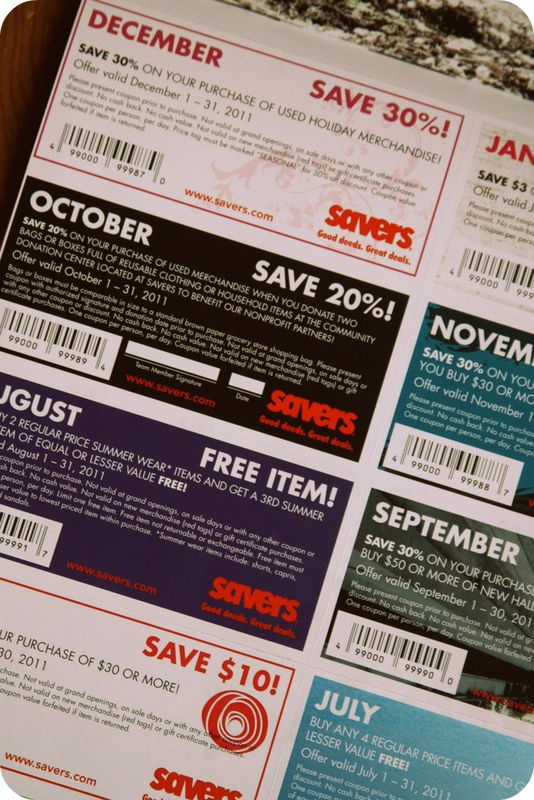 I’m most pumped about the coupons for March, May, June and December. What is up with November’s savings offer? Take 30% when I buy $30 or more worth of new merchandise? Who the heck buys new stuff at Savers? Not me! Anyway, even if that month’s a total dud, if you’re a regular shopper Savers, you should pick one of these babies up pronto. They’re available through the month of January, while supplies last. And now, I shall cross my fingers that this little blog post saves me from any awful karmic retribution. If you see a tweet about me getting a parking ticket or burning my nachos tonight, you’ll know why I’m being punished! This entry was posted in Uncategorized and tagged coupons, deals, sales, Savers, thrift store, thrift-store shopping, thrifting by highplainsthrifter. Bookmark the permalink. SCANDAL! I am totally turning you in. OK, no I’m not because you’ve tipped me off on a great resource and I’ll be hitting up the Columbia Heights Savers for my own calendar shortly. Which I will pay for.